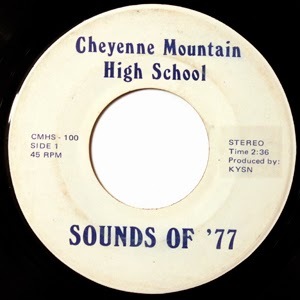 Taking a page from Dickie Goodman (look him up kiddies), the students at Cheyenne Mountain High enlisted the help of KYSN 1460 disc jockey Mark McDonald to record this 1977 audio memento. Flipside includes a skit of a drama instructor (not credited) teaching Macbeth, and being interrupted by a lengthy class announcement. In 1983, KYSN changed to an oldies format and became KKHT. Two years later the station again flipped to a simulcast of its then sister station KKCS-FM.